The well-turned-out officials had reached the sachivalaya in Gandhinagar on time, believing it would be another routine meeting with the chief minister. As soon as they had settled in, the attendants handed them each a sheet of paper. 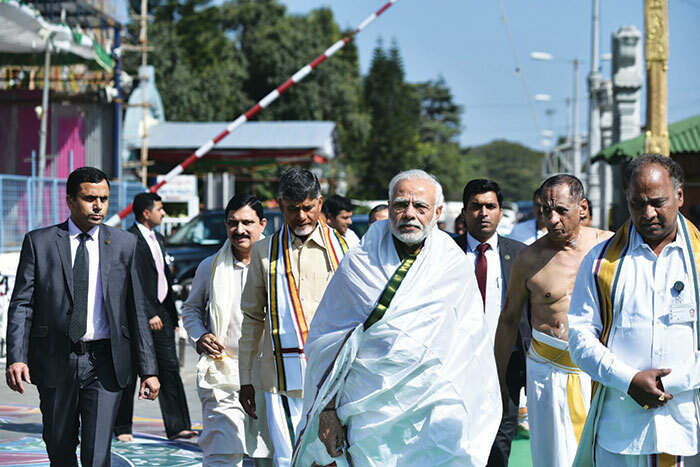 They looked askance at the blank sheets as the imposing figure of the new chief minister, Narendra Modi, entered the hall. Modi started by speaking about a government scheme to provide poor women whose husbands had died sewing machines for earning a livelihood. After opening comments, he asked officials to write down the detailed procedure they followed for implementing the scheme. This was all new for the secretary and additional secretary level officials; they were in a state of shock, more so from knowing that this test was being judged by the chief minister himself. This was in 2001, a few months after Modi became chief minister of Gujarat. He had been scrutinising the schemes aimed at changing the lives of the common man. The reason he chose to quiz the bureaucrats on the sewing machine scheme was because it was a simple enough scheme. But Modi was aghast at the responses. “Not a single officer had a clear idea of how a simple scheme like that was to be implemented properly,” the chief minister told Vijay Chauthaiwale, then vice-president of Ahmedabad-based Torrent Pharmaceuticals, during an interaction with the corporate honcho. 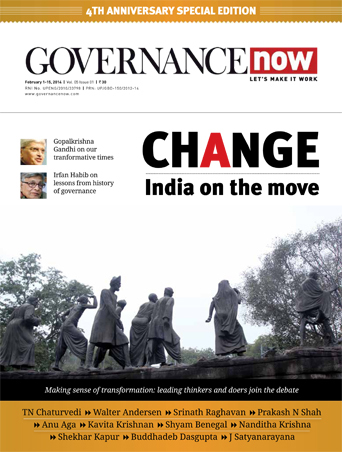 Chauthaiwale told Governance Now that Modi could immediately fathom why a plethora of generous pro-people schemes were making no difference to peoples’ lives. Modi would later speak of this experience at public rallies across Gujarat to make the point that the previous Congress regimes had created many schemes but since no serious thought had gone into the nitty-gritty, these had not made impact. People who have known the prime minister up close say his magic – which according to analysts handed the BJP a landslide victory in Uttar Pradesh despite anger over demonetisation – is not all about charisma: it emanates from his good habits of working hard, being a keen listener, taking every issue seriously, and openness to new ideas, which he refines to perfection. 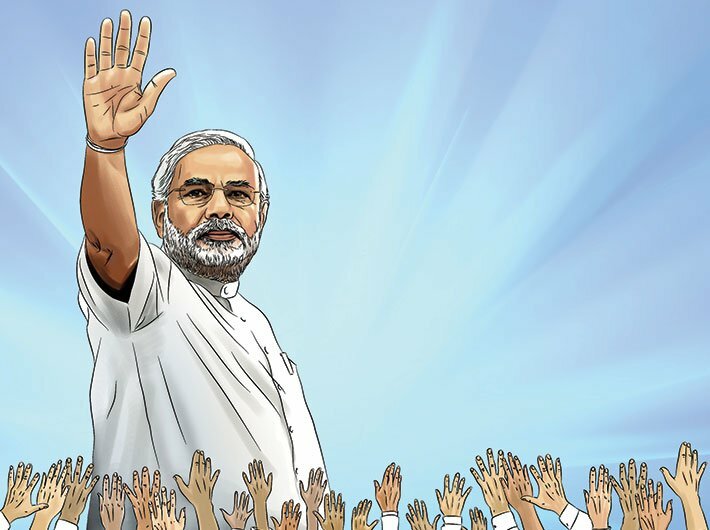 There’s no place for courtiers to hang around the tall and seemingly aloof figure of Modi. Another aspect: How does Modi get his ideas? Or, put another way, how does a relatively low-rung official like an undersecretary get noticed by the prime minister of 1.2 billion people? Those who know his ways say he uses technology with gusto; he fishes for people with ideas on the PMO’s portal and other digital platforms he has floated for this very purpose. He goes through each post, handpicks those he likes and invites those who sent the selected ideas for a presentation. He also sources ideas as well as feedback on his initiatives from his personal contacts in many different fields. “He gets ideas from crowdsourcing,” says a BJP member. Khalid Jahangir, the BJP spokesperson in Kashmir, told Governance Now that Modi had called him personally to know his opinion on how central funds for distribution as relief to victims of the catastrophic 2014 floods in Kashmir should be dispersed to ensure efficient delivery. “I suggested that funds should not be given to the state government as officials would find ways to pilfer from them,” he says. The new system caused some distribution delays, but ensured the money went into the bank accounts of the flood victims: there was no leakage. Verma’s book gives a detailed insight into Modi’s life right from his school days during which he helped his father sell tea at the railway station in Vadnagar, a small town in north Gujarat, to becoming a mass leader. Speaking about Modi’s vision, Verma told Governance Now that while the whole world was trying to vilify him for the Gujarat riots, Modi’s mind was searching for a bureaucrat with a vision who could turn around the loss-making Gujarat State Electricity Board (GSEB). Back then, like many other states, Gujarat was facing huge power shortage. The GSEB was bleeding the exchequer. Against the revenue of Rs 6,280 crore, its losses amounted to Rs 2,246 crore (2000-01). According to media reports, back then, the GSEB was paying Rs 1,227 crore in interest for loans taken to keep it going. The board had one of the highest transmission and distribution losses – 35.27 percent. More importantly, Modi was worried because without electricity, his vision of making Gujarat a hub of business and industry would never happen. Modi zeroed in on Manjula Subramaniam, a Gujarat cadre IAS officer who, as joint secretary in the PMO, had played a key role in economic liberalisation. Subramaniam became chief secretary of the state and chairperson of the GSEB. This was the beginning of a great turnaround story that has since become a case study for academicians and planners, and is listed in a World Bank report too. This writer also recalls a closed-door meeting with media persons of a business newspaper at which Modi described how he managed to get Tata Motors to set up a car plant in Sanand, Gujarat, within hours of the company being thrown out of West Bengal by Mamata Banerjee’s government. “On that day, I shut myself in a room to watch television news. As soon as Mamata Banerjee’s announcement that the Tatas would have to return the land [acquired for car plant] to farmers in Singur came, I sent an SMS to Ratan Tata: ‘Welcome to Gujarat’. Ratan Tata took the first flight to Ahmedabad and within 24 hours, the Tatas had acquired all the permissions for setting up the car plant in Sanand and announced it to the world,” Modi told staffers of the business paper. No wonder Tata, 79, makes it a point to attend the Vibrant Gujarat summit, a biennial event showcasing the state as an economic powerhouse with an industry-friendly environment. At this year’s summit, Tata praised Modi profusely for his vision and tremendous zeal in execution. He spoke a few lines in Gujarati and was greeted with thunderous applause at the summit held at the Mahatma Mandir in Gandhinagar. When it comes to taking administrative decisions, there are apparently no relationships involved for Modi. “For him, it’s all work-based relationships, he doesn’t trust anyone,” says a person who knows Modi’s ways of functioning. The only exception is Amit Shah with whom Modi shares a cozy bond. The source described the duo as a perfect combination, complementing each other in their common political mission. He finds an unusual analogy, in terms of Karl Marx’ theory of society: Modi is the superstructure, with his image of being a good and honest administrator, a hardworking man, a strong-willed decision maker; Shah, on the other hand, is the infrastructure, working tirelessly on organisation, keeping tabs on political possibilities and formulating strategies for elections. 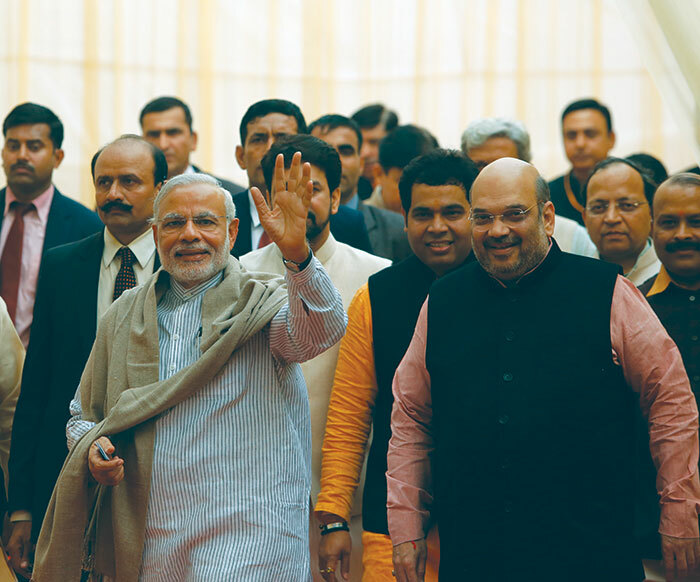 The recent Uttar Pradesh elections are a good study of the synergy demonstrated by the Modi-Shah duo. “Amitbhai is someone who never loses his cool except when someone is dishonest to him. He documents the result of each and every election and makes this his study material for the next challenge. For example, after the BJP’s defeat in Bihar, he didn’t push the dismal outcome for BJP under the carpet. He studied the outcome to identify shortcomings in the BJP’s election strategy and drew lessons for the UP elections,” said the source. In UP, he got in touch with lowest rung of party workers. “Like Modiji, he believes in communicating directly to the key people, as a message passed through a chain of command often gets lost,” a close political aide of Shah said. A senior BJP leader associated with the UP elections told Governance Now that the media was right in asking why a prime minister would spend three days campaigning in one city – Varanasi – for a state election. Sharing greenroom talk, he said: “By the time the last phase of elections (in eastern UP) was close, we had realised our party was winning comfortably. At this stage, the prime minister reportedly asked Amit Shah why the BJP should remain complacent and stay content with a good lead when going the whole hog for the last phase of campaigning could make for a tremendous win.” Modi decided to intensify his campaign. The rest is history. Not many would believe that Modi and his five siblings were raised in a predominantly Muslim neighbourhood in Vadnagar. Verma said the hyped media coverage had clouded many facts about the PM’s life. For example, he says, not many people would believe that despite being poor, Modi’s father Damodardas Modi – a stoutly built tall man – had supported a poorer Muslim boy for two years. “Abdul Latif was a young boy mired in poverty when he had to write his 10th exams. He was admitted to the Modi household and stayed with them for two years,” Verma said. Today Latif is an employee of the publicity department of the Gujarat government. When Rajinder Sachar visited Gujarat to compile a report on the socioeconomic condition of Muslims across India during the UPA regime, he tried to point out that the Modi government had done nothing for the community. Modi told Sachar point blank that his developmental agenda was meant for improving the lives of 5.5 crore Gujaratis and not a particular community. Verma claims he had travelled across Gujarat to understand people’s perceptions on Modi. 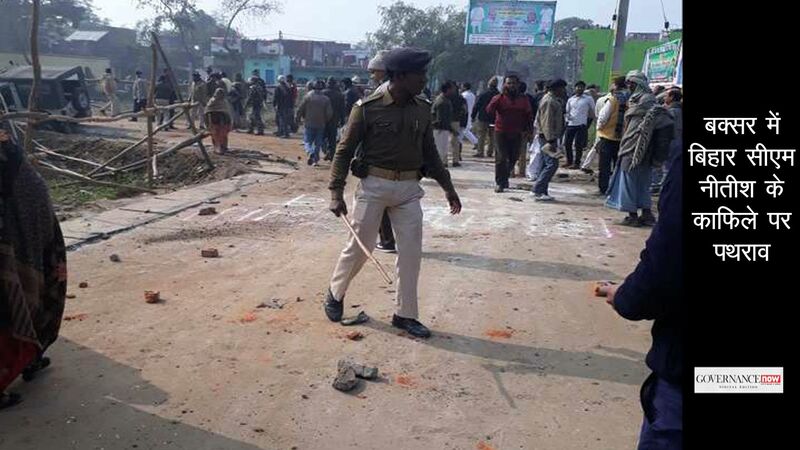 “Muslims across the state seemed to appreciate Modi’s policy – that development helps all and focus on one community puts them in disadvantageous position,” Verma said. Also, he writes in his book that that Gujarat, with a 10 percent Muslim population has 10 percent government jobs held by Muslims, the highest in the country; and 50 percent of zakat (donations by Muslims) to the central body comes from Gujarat. After Modi took charge in Delhi, Verma was appointed a BJP spokesperson. A little-known fact about Modi is that he enjoys cooking. “I am not sure if he still has the passion for it, but his childhood and college friends told me they used to wait for the food cooked by him during picnics,” Verma said. Today Modi is rated as the most stylishly-dressed leader and an Ahmedabad-based apparel store has even launched ‘Modi kurta’ and ‘Modi jacket’ after him. Verma said he had learnt the importance of grooming and dressing appropriately in childhood. Back then, he used to have just a couple of pairs of dresses but would make it a point to wash them daily and keep them creased and free of wrinkles by folding them and pressing them under his pillow overnight. With his stony countenance, he may not look affable, but many vouch for his memory about people and his public display of affection for them. Modi has surprised many people by calling them by their first name years after meeting them. A friend of Modi from Bharuch, in central Gujarat, had taken his young daughter to meet him in Ahmedabad. Months later, when he was visiting Bharuch as chief minister, Modi walked past a row of girls who were showering petals on him. Suddenly, he stopped and said to one of them, “Kem chho, Kalyani? (How are you, Kalyani? )” It was a pleasant surprise for the young girl, who never thought he’d remember her and spot her in a mob. One of Modi’s first guests at 7, Lok Kalyan Marg (the PM’s residence) was a childhood friend who, like him, sold tea at the Vadnagar railway station. A Delhi-based BJP leader says a party supporter in Washington DC told him he had also been a guest of the PM in India during a visit to Delhi. It seems this person had played host to Modi when he’d visited the US before becoming chief minister. Strange though it may sound, Modi’s strong bond with the Gujarati diaspora became evident after his negative portrayal by the media post the 2002 riots. Gujarat was getting isolated and FDI figures were falling. At this time, Modi advised his ministers to visit different countries and woo non-resident Gujaratis (NRGs) for investments. It helped and FDI position started improving. As chief minister, he himself visited Hong Kong and was so fascinated by its huge trade towers that he decided to build the GIFT City near Gandhinagar. Verma writes in his book about sitting with Modi on a marshy seaside in the Rann of Kutch. Modi was dwelling on the beauty of nature, soliloquising like a poet about birds that come from far-off lands to lay and hatch their eggs, about the beauty of sunsets and sunrises. He told his would-be biographer he loves to sit by the Rann and meditate. Verma said he was lucky to be there to see this side of Modi’s personality. “He lives for others, but there is a deep emotional side to him, like all of us,” Verma said. The world saw him break down at the Facebook office in California while speaking about his mother’s hardships as a maid working to raise her children. Verma said Modi has distanced himself from his family, but he found him very emotional while talking about each member during his interviews. On taking sanyas (a vow of renunciation) and leaving home for his missionary work, he’d burnt his old clothes as a symbol of unburdening himself ­­of all the baggage of his past. But his love for his family remains intact. An Air India hostess, who was on duty with PM for 14 flights, says unlike other VIPs, PM always reciprocates her ‘namaste’. Interestingly, Modi has found a new way to connect with the younger generation and also to make his staff feel happy. He has started the custom of inviting children of officials working in the PMO on their birthdays. The children get a chance to meet the PM. “The PM said the children must know where their parents are working,” said a source. Modi is also a published author: among other titles, A Journey: Poems by Narendra Modi, translated by Ravi Mantha, and Abode of Love, a collection of short stories written during the Emergency, when he was underground. Both are translations from Gujarati. He doesn’t seem to make much of his poems, though: In the foreword, he says he doesn’t think they are “extraordinary literary creation, just streams of thought, like a spring of fresh water, of things I have witnessed, experienced and sometimes imagined. May the soft sound of this spring’s waters resonate in your ears and mind, and touch your heart! It is this that will be a blessing for me.” His stories are about heroes who rise from difficulties; about human bonds and love. After reading these books, Modi can be seen in a new light – that there’s a completely different side to the person who is rated one of the strongest leaders in the world today.